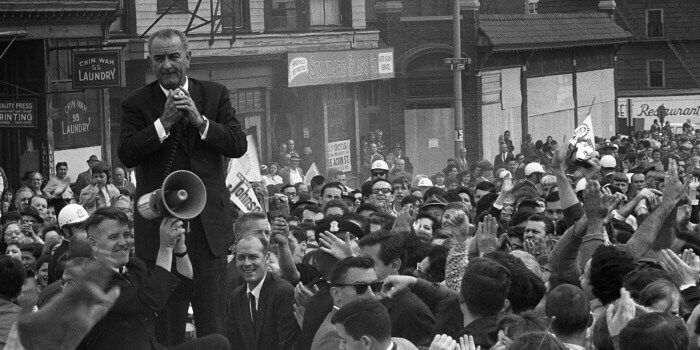 President Johnson addresses the crowd at a campaign rally. LBJ Library photo by Cecil Stoughton. 2016 marks Westbay Community Action’s 50th Anniversary providing services to Kent County residents. We continue to celebrate the positive, sustainable outcomes in which we strive to empower the families of Kent County. Westbay remains a leader in Rhode Island and is an agency that assists individuals and families with achieving economic self-sufficiency. The 1960’s were a turbulent time of change, and in 1964, President Lyndon B. Johnson decided it was time to change the way America fought poverty. President Johnson went to “war” with American poverty determined to mold his country into the great society of his dreams. The War on Poverty legislation created countless programs to assist American citizens and their families with everything from education to keeping food on the table. 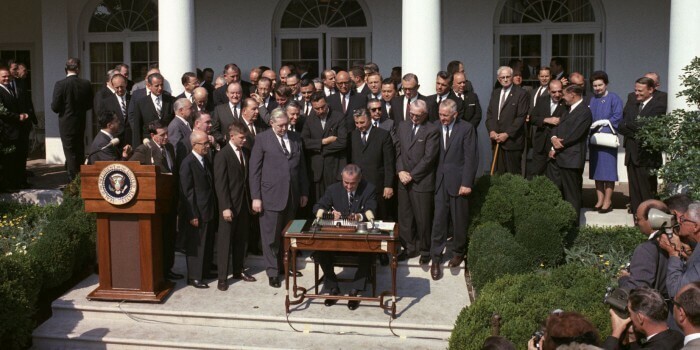 President Johnson signs the Poverty Bill. LBJ Library photo by Cecil Stoughton. The War on Poverty also inspired many local organizations to help their community. One such organization, founded on January 27, 1966, was Warwick Community Action. This organization paved the way to “Fight the War on Poverty” and provide a voice to the individuals and families of Kent County. Warwick Community Action continued this fight until April 22, 1993 when the Board of Directors voted to change the organization name to Westbay Community Action, Inc. The mission of Westbay Communty Action, Inc. is to assist economically disadvantaged individuals and families achieve and sustain self-sufficiency. Westbay Community Action is excited for 2016 as we plan on holding events throughout the year that will allow us to give back to the wonderful individuals and families of Kent County. Please be on the look out on Westbay’s Facebook, Twitter and website for updates on Westbay’s Golden 50th Anniversary Events.